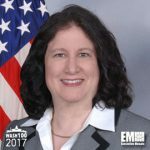 Executive Mosaic is honored to announce Anita Bales, director at the Defense Contract Audit Agency, as an inductee into the 2017 edition of the Wash100 — Executive Mosaic’s annual selection of the most influential voices in the government contracting arena. As director of the DCAA, Bales oversees the worldwide operation of the agency and its resources as well as directs the planning development, execution and evaluation of comprehensive programs that implement public laws to carry out the agency’s contract audit mission. Bales reports directly to the Pentagon’s comptroller in her role at DCAA. She previously served as a deputy director for the DCAA, deputy auditor general for the Army Audit Agency, program director for the financial management audits at the AAA and AAA audit supervisor for the central region. Bales also serves as a member on professional memberships and associations including the Association of Government Accountants, American Society of Military Comptrollers, Association of the U.S. Army and the Professional Advisory Board of Drake University’s School of Accounting. She also holds a bachelor’s degree in accounting from Drake University and a master’s degree in management from the Syracuse University’s Martin J. Whitman School of Management. Executive Mosaic congratulates Anita Bales and the DCAA team for their selection to receive this award.